There's nothing wrong with watching cartoons as an adult anyway! The closer I get to turning 20, the more nostalgic I get towards my childhood and everything that’s happened to me up until now. Even if I’m growing up, one of the biggest things that has stuck with me to this day is my love of cartoons. As an avid lover of cartoons and fictional characters I’m too attached to, I can’t help but think how awesome it is that even today, there are still some really good shows out there that even I can relate to! On November 4, 2013, a new show from Cartoon Network emerged titled “Steven Universe.” This is one cartoon in particular that I can’t help but love a lot because it doesn’t feel like what a typical “children’s cartoon” is considered to be. I heard a lot about this show while it was in its development due to my previous interest in the cartoon “Adventure Time” and how one of the people who worked on that show, Rebecca Sugar, was behind this new project. I was fully interested because it was the first Cartoon Network animated series created by a woman. “Steven Universe” stole my heart right away and I want to personally thank Rebecca Sugar for creating such an amazing show. It didn’t take me long to start liking the characters, plot and themes of the show. 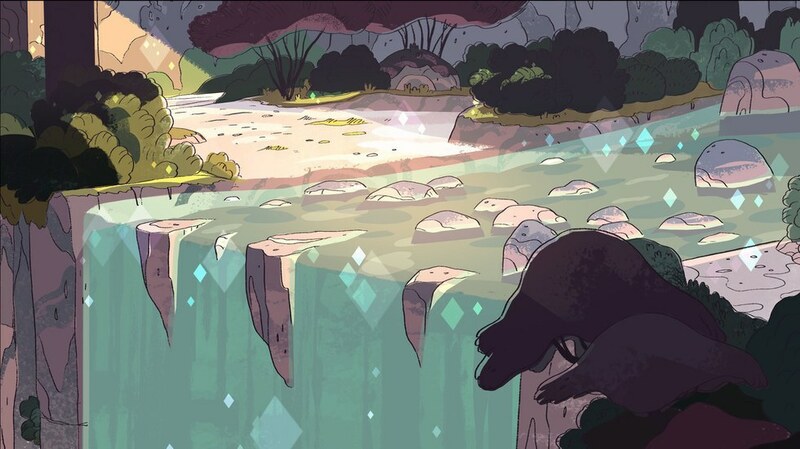 It focuses on our young protagonist, Steven Universe, who is half-human and half-gem (an alien species). He lives with three other gems named Garnet, Pearl and Amethyst who are members of the Crystal Gems, which was originally founded by Rose Quartz, Steven's mother. 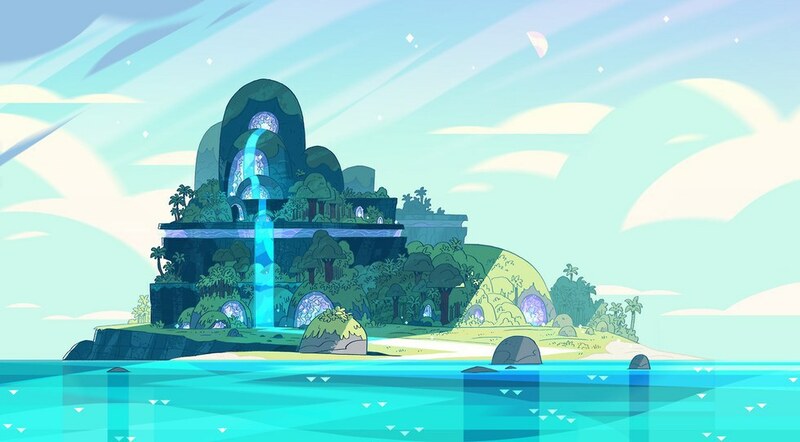 With Rose gone now, they use their powers to protect the Earth from the Homeworld gems who only want to expand their colonies without any regard to the organic life on this planet. On the surface, “Steven Universe” seems like a cute cartoon for children with bright colors, aliens, pop culture references, and fun animations tying into a Sci-Fi like feel. This show, however, is more than just the bright colors and references. Here are five reasons why you should be watching this show and hey, maybe you'll end up believing in Steven too! Warning: This piece contains spoilers, however, I'll be sure not to spoil everything, but you've been warned from this point on. 1. The music is incredible. What better way to convey lessons and messages through song? Not only are they catchy, but the lyrics in these songs are so real and relatable, I can't help but see myself in them too. All of the songs with vocals are written by Rebecca Sugar herself and she's done an amazing job in conveying a lot of feeling in short songs for this show. Each song is a good representation of what the show is all about anyway. However, I feel like this song conveys the message of "Steven Universe" so well in just over a minute! It's bright and optimistic, but still shows how nothing is just "peace and love" in the world. There's war and death, but that isn't to say that we should only focus on the bad. Steven makes it apparent that he wants everyone to feel happy and good while having fun together. 2. The representation of LGBT+ relationships is important. It's important for children (and the public), especially in this day and age, to be able to see a good representation of a healthy and loving LGBT+ relationship because it shows that such relationships are neither wrong nor unhealthy. To some degree, it is progressive and daring that LGBT+ couples are being shown in this cartoon for children, but in reality, these relationships are not unusual at all and this show enables viewers to know that their feelings are valid and that what they're feeling is normal and OK.
"Steven Universe" does an incredible job of portraying a handful of these relationships, especially through the formation of a close bond known as fusion. Through fusion, gems form together and are united as one single unit. It's an interesting concept that this show created because it's more or less a metaphor for healthy and even unhealthy relationships. Not only is it representing relationships between characters, but it teaches its viewers that not all relationships are perfect and happy, but when you work together with your partner and understand each other's feelings, the experience is amazing. Fusion is such a key aspect that there's even a cute little extra clip about it in detail highlighting its importance! 3. There's positive representation of dealing with trauma. Typically speaking, you don’t really see children’s cartoons portraying situations that are traumatizing for its characters unless if it’s in some form of comic relief. Another positive aspect of "Steven Universe" is its well written and realistic portrayal of trauma and its effect on characters, whether it's years or even hours after an event. Take Pearl, for example, who is still traumatized by the death of Rose Quartz. It is clear how much she is hurt, how much she misses and still loves Rose. She's heartbroken because the one she loved chose another. She feels left behind and as if no one understands her because they will never have what she had with Rose. Many times in the course of the show, we see her still obviously effected by this traumatizing loss and it makes for a great source of character development as we see Pearl work through her trauma and be there for not only Steven and the other Crystal Gems, but herself too. It's important to show this development because it teaches not only children, but everyone that it's OK to take your time recovering and mistakes happen frequently, but that isn't to say that you're a bad person. 4. The art is amazing. 5. The humor is lighthearted and refreshing. A lot of times I see cartoons for children with really flashy and obnoxious jokes aimed at getting humor across for its children audience. 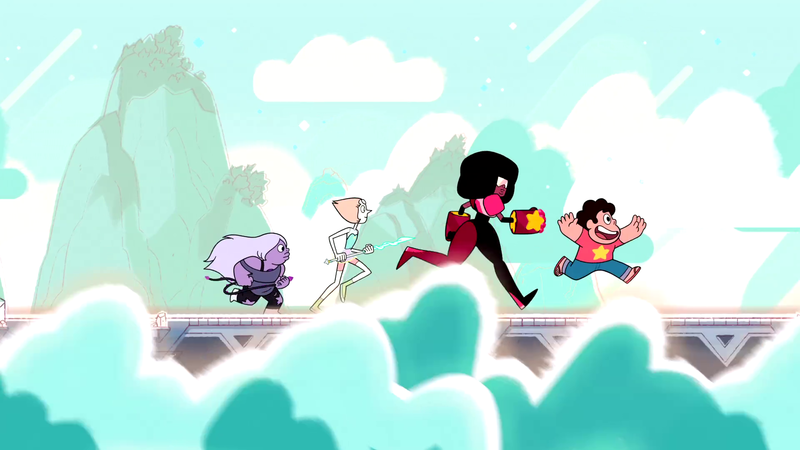 However, "Steven Universe" feels a little different with its humor as it's not really that obnoxious or loud. Despite its appearance and various amounts of dumb jokes it does have, there are several instances that are cleverly written and able to be enjoyed by everyone in just the dialogue for the characters alone. Shown above is one of my favorite scenes which, upon seeing for the first time, I couldn't help but laugh a lot because of how out of nowhere it was. It's this lighthearted humor that makes me appreciate the show's effort in reaching out to all ages. I've only just scratched the surface of what "Steven Universe" is actually about. There's a lot more to this show and if I keep writing, then you'll probably be here for a very long time. Nevertheless, I still stand by this show being extremely important and should be watched by everyone. It's full of a lot of great things and just watching it makes me feel content and at ease. I would have loved to be a child growing up watching this show right now and feeling really good about myself. I think it's safe to say that I believe in Steven.